Making an acoustic guitar is much easier than you’d think. With basic woodworking skills, a modest work space, and only a few special tools, even an amateur can make an instrument fit for the concert platform with this guide. Fully illustrated instructions guide the builder through the entire creative process from choosing materials for the guitar to stringing and setting up. The guitar created in this book is a steel-stringed cutaway orchestra model with 14 frets to the body joint. This pattern is ideal for the finger style player, providing excellent projection in bass, middle, and treble ranges. Plans are included for the entire instrument as well as detailed drawings of individual parts. This manual comes complete with instructions on how to tune the soundboard, place the frets accurately, and adjust the action for comfortable playing. I am writing you to express my pleasure with the book I ordered, "Step by Step Guitar Making." I do a lot of work with my hands: leather craft, wood carving, engraving, custom knife and fishing kits and a few other things. I wanted a guitar kit to start with. But it is not in stockand would not be until September 12, 2012. No problem! I can wait until it's ready to be shipped. I have to tell you that I have purchased many ôHow to booksöon many subjects. 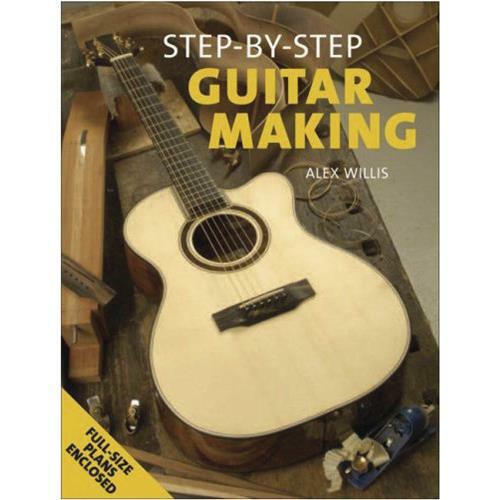 Most of them are not worth the paper they are published on.The book I received, "Step by Step Guitar Making" by Alex Willis is one of the best I have ever read. I think I can make one from scratch but I'll wait for the kit. I would recommend this book to anyone interested in guitar making. Please feel free to use this letter and my name if you want. I can.t wait for the kit but I will. Please send it as soonas you can.